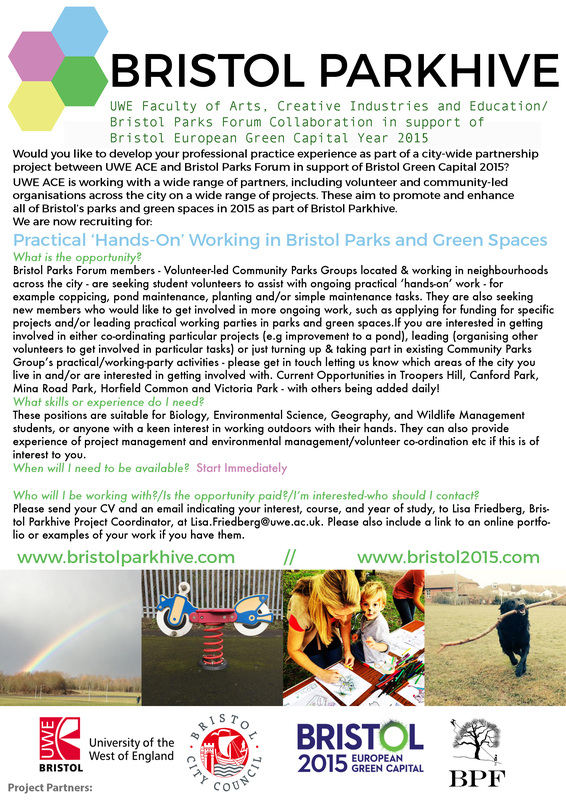 Bristol Parks Forum members - Volunteer-led Community Parks Groups located & working in neighbourhoods across the city - are seeking student volunteers to assist with ongoing practical ‘hands-on’ work - including for example, coppicing, pond maintenance, planting and/or simple maintenance tasks. They are also seeking new members who would like to get involved in more ongoing work, such as applying for funding for specific projects and/or leading practical working parties in parks and green spaces. If you are interested in getting involved in either co-ordinating particular projects (e.g improvement to a pond), leading (organising other volunteers to get involved in particular tasks) or just turning up & taking part in existing Community Parks Group’s practical/working-party activities - please get in touch letting us know which areas of the city you live in and/or are interested in getting involved with? Suited for: These positions are suitable for Biology, Environmental Science, Geography, and Wildlife Management students, or anyone with a keen interest in working outdoors with their hands. They can also provide experience of project management and environmental management/volunteer coordination etc. if this is of interest to you.